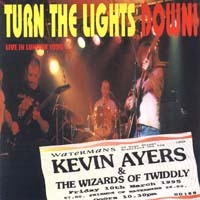 Market Square Records CD Album - Kevin Ayers - Turn The Lights Down! KEVIN AYERS is that rare commodity: a true original. His songs are a soundtrack of life, embracing the inner rhythms of us all. This important Market Square release documents a complete live set from March 10 1995 when Kevin toured with Liverpool's Wizards of Twiddly. This collaboration came about following some bill-sharing in October 1994. It marked the return of Ayers to a band format after a period of semi-acoustic solo and duo work. The Wizards, with their hybrid of rock and brass instruments, offered the rich canvas against which Kevin Ayers could stretch out. The gig captured here fills in a missing piece of the Kevin Ayers jigsaw. It was the final night of the first UK tour with the Wizards and it is imbued with a rare ambience and energy. similar in feel to Kevin's vintage 70s albums. The songwriting and vocals are up to his highest standards. Ayers appreciators will know what to expect, and will not be disappointed." "The only man I know who can blend jazz, rock, country, folk and whatever you want and make it sound good."